(Host) A former slave who won his freedom and settled in Poultney will be honored by the town on Sunday with a historic marker. (Keck) Jeffrey Brace’s amazing story was not uncommon in the 18th century. Abducted from Africa, he was taken by slave traders on a horrific transatlantic voyage. He endured cruel masters as well as kind ones and won his freedom fighting in the Revolutionary War. What makes Brace’s life story so unusual is that it was written down and published in an 1810 memoir. Green Mountain College professor John Nassivera specializes in African American literature. He says that while there are a fairly large number of slave narratives in existence. . .
(Nassivera) "There are very, very, very few that are written by someone who remembers being captured in Africa. He was 16 years old when Jeffrey Brace was captured, and his original name was Boyrereau Brinch and he used Brace because it was similar to Brinch. And he remembers the whole act of the capture and his accounting of it is very accurate and graphic and detailed." (Keck) Brace earned his freedom in 1783, settled in Poultney, married and had a family. Though Brace had learned how to read and write, he became blind in his old age and spent his final years in the St Albans area. There he met a white abolitionist who wrote down his life story. The University of Vermont has one of the few remaining copies of it in its rare book collection. A professor from the State University of New York at Buffalo did further research and published her work on Brace in 2005. It was because of that book that many of Brace’s descendants found out about their ancestor. 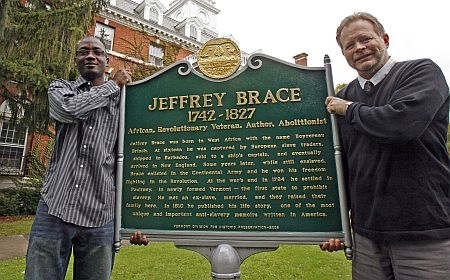 Green Mountain College professor John Nassivera says 40 of those descendants will be in Poultney on Sunday to recognize Jeffrey Brace’s legacy. (Nassivera) "They are the only African-Americans alive today who can trace their ancestry back through the slave system to the exact person in Africa who was captured, when he was captured and within a couple hundred miles the exact place where he was captured. So it is an extremely unique perhaps absolutely unique story." (Keck) Nassivera says it’s wonderful to see Poultney and Green Mountain College welcome these family members back to the town as honored guests. And coming so close to Yom Kippur, the Jewish holiday of atonement, he says, it seems especially fitting. As the nation’s demographics change, Vermont tourism officials are beginning to respond. In recent months the state has begun taking the first steps to attract African-American tourists.